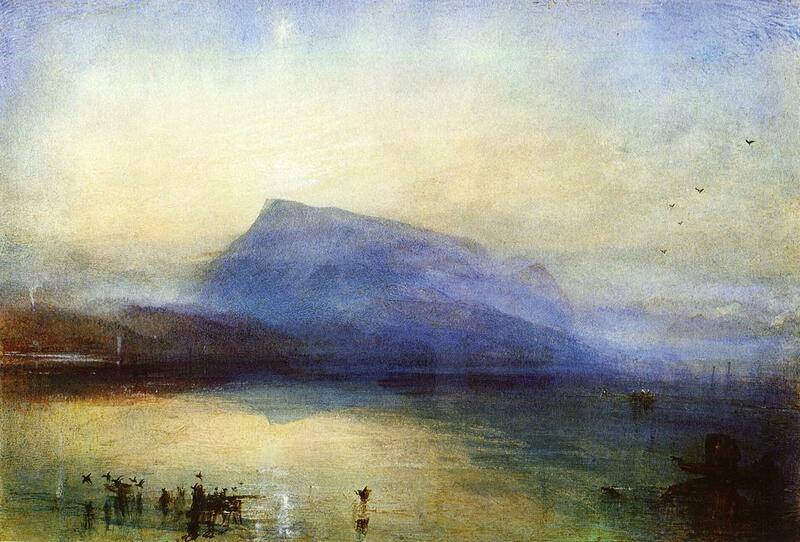 Joseph Mallord William Turner, The Blue Rigi, Sunrise (1842), watercolour on paper, 29.7 x 45 cm, The Tate Gallery, London. WikiArt. Two late paintings portraying tranquil sunlit scenes of dawn over still water, remarkable in their anticipation of Impressionism. A mountain, blue in the early dawn, seen from the opposite shore of a flat calm lake. In the left foreground a complex network of dark shapes suggests dogs chasing wildfowl at the shore of the lake, rippling the water surface. In the right foreground, merging with the darkness, fishing boats with a scattering of small lights. In the distance low hills at each side of the central mountain mass, faint patches of mist clinging to the top of their woods, and a couple of fine plumes of white smoke rising. The mountain rises to a sharp peak at the left, its plateau sloping steadily to the right, before dropping precipitously to the shore. The sky lit pale lemon, and reflected in much of the surface of the lake. At the right edge half a dozen birds fly high over the water’s edge. Venus shimmers vertically above the mountain’s peak. The view shown is that of Mount Rigi across Lake Lucerne, Switzerland, one of Turner’s favourites, the subject of several studies and finished works. A broad, flat river with the sun rising from behind central blue shadowed walls of a high castle. On the left a hill drops to vague lower levels at the water’s edge. On the right indistinct shapes suggest buildings or trees on the low banks. On each side of the castle walls there are soft hills similarly high above the water. Just to the right of the centre foreground a cow stands in the water, its head low as if drinking. The water reflects the blue of the castle, and pale lemon light from the sun. The central area of sky is also pale lemon with the rising sun, surrounded by pale-tinted greys suggestive of dispersing low cloud. 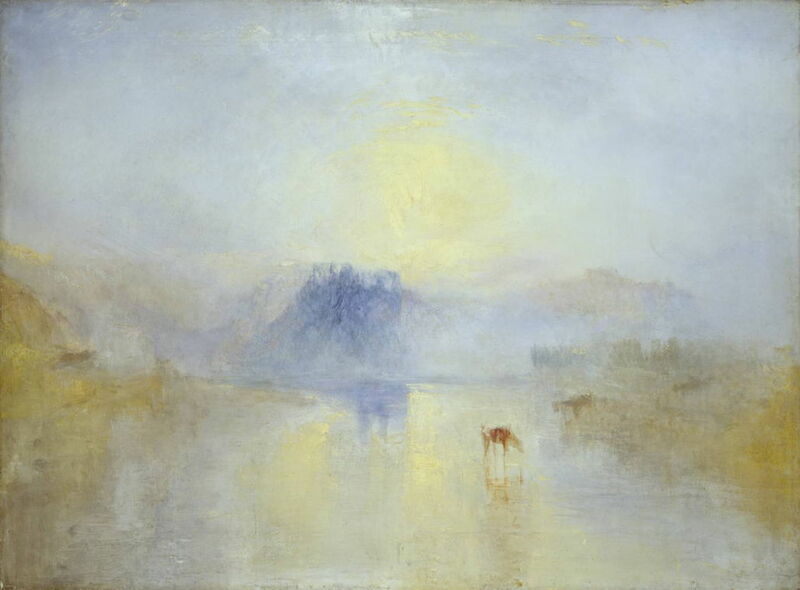 Joseph Mallord William Turner, Norham Castle, Sunrise (c 1845), oil on canvas, 90.8 x 121.9 cm, The Tate Gallery, London. WikiArt. The view shown is of Norham Castle, to the south of Berwick-upon-Tweed, at the very north-eastern tip of England. This too was a favourite view of Turner’s, which he first painted in 1797. JMW Turner was born around 23 April 1775 in Covent Garden, London. A precocious artist as a child, he first worked as an apprentice draughtsman before entering the Royal Academy schools at the age of 14, and the following year had his first painting hung in the prestigious Royal Academy summer exhibition. Travelling widely around the UK, he enjoyed early critical success with topographical and marine subjects. In 1802 he started to visit and tour through Europe, capturing acclaimed views of France, Switzerland, and Italy, particularly Venice, and dramatic impressions of severe weather and daunting terrain in the Alps. Turner’s father worked devotedly as his studio assistant until his death in 1829, leaving Turner with episodes of depression. Although he never married, he had at least two relationships, one of which resulted in two daughters by an older widow, the other with his former landlady, Sophia Booth, whom he set up in a small house in Chelsea, London. 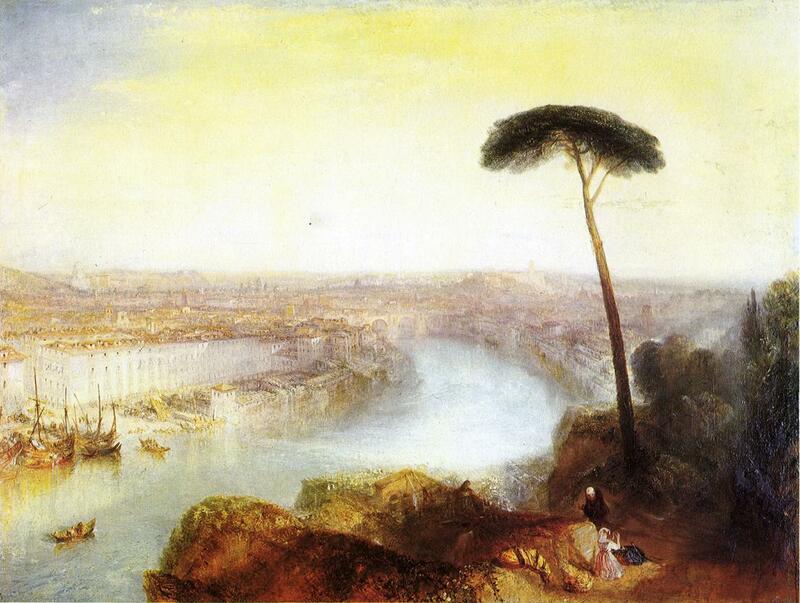 Joseph Mallord William Turner, Rome, from Mount Aventine (1835), oil on canvas, 92.7 x 125.7 cm, Private collection. WikiArt. Sold in Dec 2014 for £30.3 million. 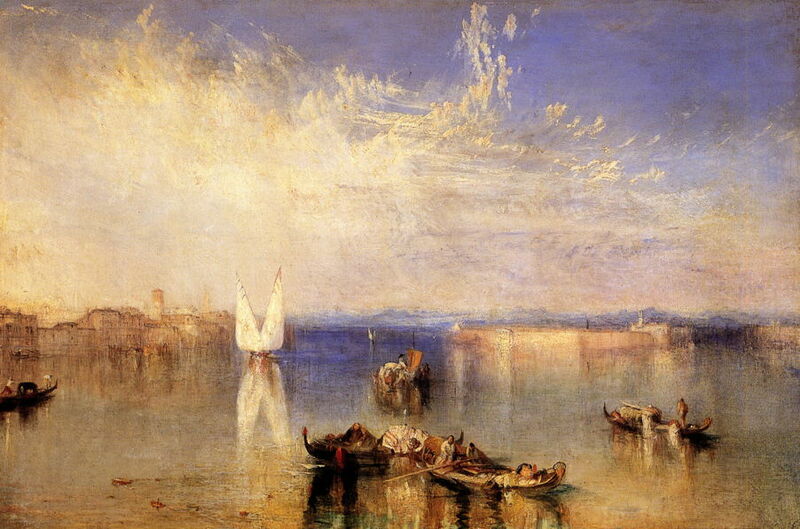 In his later years Turner’s work became increasingly unconventional, and his critics more numerous and vociferous. Although a contemporary of the other great nineteenth century British landscape painter, John Constable, their temperaments were so different as to limit civil exchange. Turner revelled in the dramatic, at one time claiming that he had to be lashed to the mast of a ship in a storm in order to experience what he later painted. His last years are well summarised in Mike Leigh’s beautifully-filmed and sensitively-scripted movie Mr Turner (2014). Turner died in Sophia Booth’s house on 19 December 1851, and such was his reputation that he was buried alongside Sir Joshua Reynolds in St Paul’s Cathedral, London. He left the works not already in private ownership as a bequest ‘to the British nation’, with the intention that they should be housed in a dedicated museum. Although that was never built, the Turner Bequest is now housed in the Clore Gallery of Tate Britain, London, with some retained in the National Gallery. His commercial success provided sufficient funds for the Turner Medal of the Royal Academy of Arts, and the Tate Gallery inaugurated the annual Turner Prize in 1984, in his honour. Turner’s early graphite and watercolour paintings continued the British tradition, with their precise architectural passages and popular topographical motifs. His greatest competitor, Thomas Girtin, died tragically young of asthma in 1802, following which Turner was able to enjoy unrivalled commercial success. 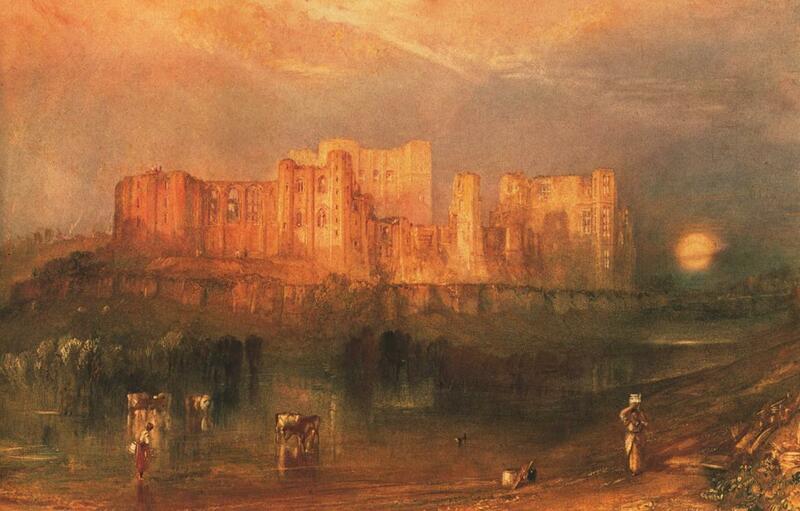 Joseph Mallord William Turner, Kenilworth Castle (c 1830), watercolour, body colour and graphite on paper, 29.2 x 45.4 cm, Fine Arts Museums of San Francisco. WikiArt. As his attention gradually transferred to the effects of light, and dramatic impressions of the sea and sky, his technique ranged more widely, involving scratching with his nails, spit, and experimental oil media. Unfortunately the latter have resulted in severe problems developing in the paint films of many of his oil paintings, even during his lifetime. However they enabled him to push the boundaries in depicting less tangible and concrete elements in his motifs, such as sunlight, waves, mist, and cloud. Joseph Mallord William Turner, Norham Castle, Sunrise (detail) (c 1845), oil on canvas, 90.8 x 121.9 cm, The Tate Gallery, London. WikiArt. Turner thus developed his making of marks, and innovative ways of applying and removing paint from the support, to take painting on beyond the physical towards the evanescent, sensory experiences which had seldom been captured earlier. This was important in the changes that were taking place in mainland European art by the middle of the century, as photography was starting to prove itself capable of generating images of people, scenes, and physical objects, and the Barbizon School led to Impressionism. Turner was also one of the first artists to be photographed, and to see photographic images. Joseph Mallord William Turner, Campo Santo, Venice (1842), oil on canvas, 62.2 x 92.7 cm, Toldeo Museum of Art, Toledo. WikiArt. Turner’s later works, in particular, are a bridge between the studied, material realism of Constable and the early nineteenth century landscape painters, and attempts to capture light and transient effects by the Impressionists of the late nineteenth century. These two paintings exemplify Turner’s skills in both watercolour and oil media in the depiction of the momentary rich sensory experiences of the light of early morning: experiences which are commonplace but had largely defied previous painters. Joseph Mallord William Turner, Keelmen Heaving in Coals by Moonlight (1835), oil on canvas, 92.3 x 122.8 cm, National Gallery of Art, Washington. WikiArt. Following Turner’s development in his works is revelatory. Starting with quite conventional watercolours in the British tradition, and large oil paintings typical of the eighteenth century, light plays an increasingly important role in his paintings over time. The key element within a motif become lit in dramatic manner, and the further distance becomes less crisp and more of an impression. Eventually in these later works form becomes subjugated to colour and light, with relatively small passages containing crisp edges and discernible shapes. These virtuoso displays of painterly skills used watercolour and oils, making him one of the first painters to push the boundaries in both media, and to accord both with the dedication that they deserve. Although commercially watercolours are still seen as being somehow inferior to oils, comparison of these two works shows that Turner made no such distinction, and was able to create similar effects irrespective of medium. Indeed his art had transcended its media. There is also a sadder story here. Visit WikiArt or Wikimedia Commons’ collections of Turner’s work, and you will see respectively only 226 and 115 works available in the public domain, out of his total output of over 550 oil paintings and over 2,000 watercolours. 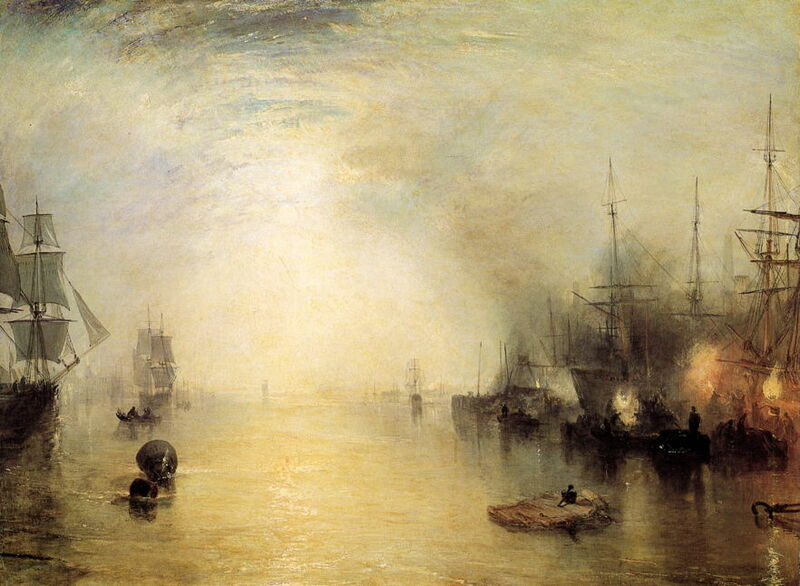 This is despite the Turner Bequest to “the British nation”, that we should be able to enjoy his paintings. Considering that he is one of the (if not the) most important and prolific British painters, this is very frustrating. I had wanted to make two of his paintings my ‘favourites’ in this article: the remarkable watercolour Heidelberg: Sunset (c 1842) and Modern Italy – the Pifferari (oils, 1838). Although both are held in public collections in the UK, I have been unable to find copyright-free digital images of them, despite the fact that Turner’s works have been out of copyright (even under current legislation) for nearly a century. This is a tragic indictment of the restricted access to these great works of art. Although you may find it hard to view his works online, Turner is a very popular subject for books. The EY Exhibition: Late Turner – Painting Set Free is at the Getty, Los Angeles, between 24 Feb and 24 May 2015, then at de Young, San Francisco, between 20 June and 20 Sep 2015. Sadly it lacks many of the better works which were included in the Tate Britain showing which ended on 25 Jan 2015, but is still not to be missed. Posted in Painting and tagged Girtin, landscape, Mr Turner, oil paint, painting, Turner, watercolour. Bookmark the permalink. As of 23 Feb 2015, the iTunes Store movie Mr Turner is now available, and DVD/Bluray versions imminent. Updated today to add link to movie review.